Malacostraca је највећа од шест класа ракова. Познати су и под називом Виши ракови. Садржи око 40.000 врста. Виши ракови живе у морима и слатким водама, имају чланковито тело и дишу шкргама. ^ Little, Colin (1983). „Crustaceans and the evolution of the arthropods”. The Colonisation of Land: Origins and Adaptations of Terrestrial Animals. Cambridge University Press. ISBN 978-0-521-25218-8. ^ "malacostracan". Oxford English Dictionary. Oxford University Press. 2nd ed. 1989. Little, Colin (1983). 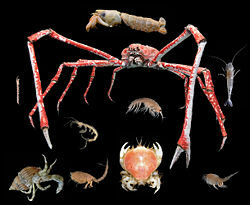 „Crustaceans and the evolution of the arthropods”. The Colonisation of Land: Origins and Adaptations of Terrestrial Animals. Cambridge University Press. стр. 63—106. ISBN 978-0-521-25218-8. Ова страница је последњи пут уређена на датум 23. март 2019. у 13:27 ч.